Oppo known for camera-centric smartphones and which has got very good traction in India, is setting up an R&D Centre in Hyderabad, India. This R&D Centre will be brand’s first in India to give boost to Make For India initiative of Government of India. 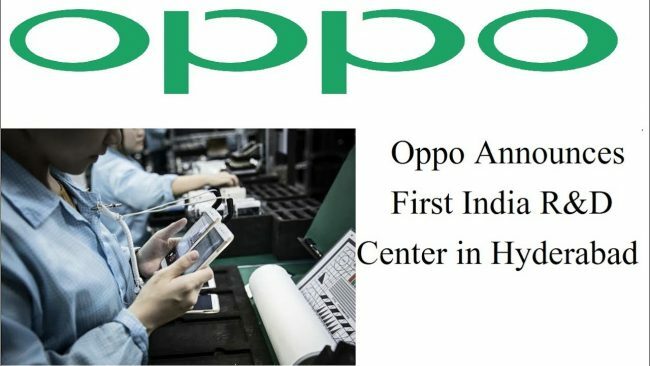 The Hyderabad R&D Centre is Oppo’s 7th facility globally with the other 6 in Beijing, Shanghai, Shenzhen, Dongguan, Japan (Yokohama) and US (Silicon Valley). With this expansion, OPPO aims to offer consumers the best of technology and innovation. The R&D teams are focused towards understanding consumer trends and demands to come up with insights that will help serve a particular market better as stated by the company in its press statement. This facility in Hyderabad will be headed by Tasleem Arif. As the Vice President and Head R&D, Oppo India, Tasleem will be leading the team to build world-class R&D teams which will focus on software localization for Indian consumers as well as device quality. With almost 15 years of experience in Mobile Software, Design and Development, Tasleem was associated with Samsung as Head – Samsung Make for India Innovations (R&D), India Hardware-Software Product Planning prior to joining Oppo.